JHP Fastener’s B-19 and S-36 Flexarm Tapping and Assembly Arms are ideal for taking care of prep work such as chamfering, reaming and deburring. 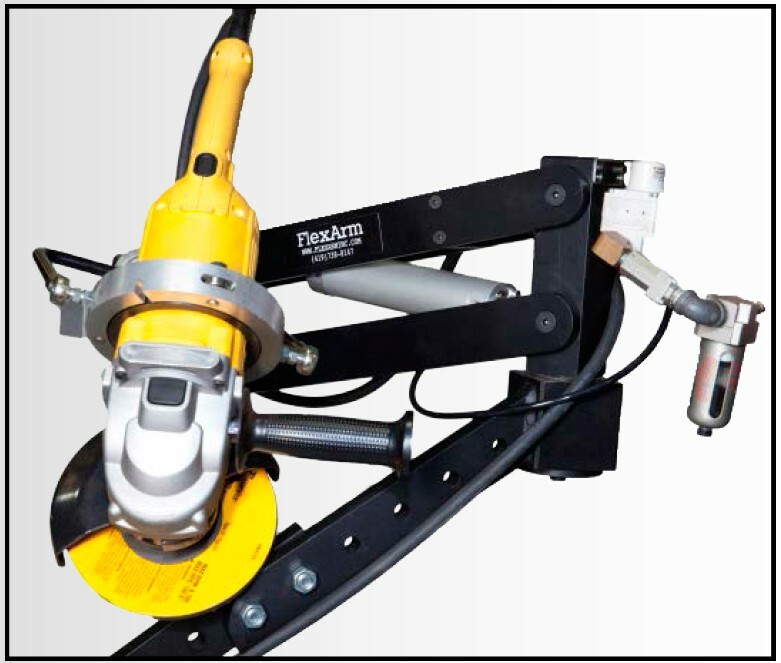 S-36 and B-19 Flex Arm Tapping and Assembly Arms eliminate the setup in the mill and reduce material handling, while also saving time and money by installing a tapping arm directly over a work piece. Give us a Call at 1-800-783-0910 or Contact Us and we will help you get the right FlexArm for your application. Tool Weight Range: 1-35 lbs. In addition, the B-19 FlexArm has an added gimbal that provides 4 additional rotation points for improved flexibility. When a tool is mounted with the added gimbal, the combination provides a smooth and almost weightless tool at almost any angle for the most labor-intensive applications. Tool Weight Range: 1-25 lbs. Additionally, FlexArm Torque Reaction Assembly Arms come complete, ready to mount and include the arm and table mount. They are also available with a torque resistance of up to 800 lbs. and a reach up to 84”. Free, no-obligation 30-day trial available. On-site Engineering staff, ready to offer solutions for unique applications. FlexArm manufactures and stocks products at their headquarters in Wapokoneta, Ohio to ensure quick response times. FlexArm offers an extensive inventory of tap holders and repairs parts. The tapping unit is a turnkey system, ready to set up and start tapping. Package includes tap holders, filter/lubricator, and hose. Guaranteed precision and dependability when tapping #0-6. Tap up to 2” with our hydraulic tapping machines! Contact Us for more information on how our FlexArm tapping and assembly arms can assist you with your next project, or call us directly at 800-783-0910 for all your tools, rivets and more!